What did I expect? A droopy adaptation of the Fitzgerald masterpiece. What did I get? Jack Clayton’s version of F. Scott Fitzgerald’s classic 1925 novel evinces much earnest endeavor by a great many talented and well-meaning people, but it’s foredoomed by its unaccountably guileless approach. 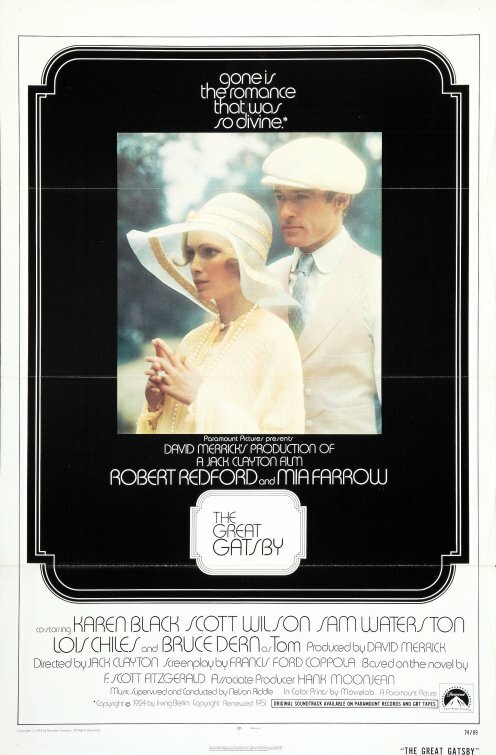 Robert Evans hit on the idea of adapting Gatsby as a means of flattering his then-wife Ali MacGraw and, indirectly, of celebrating the new class of nouveaux riches residing in Malibu — didn’t anyone notice the irony? Pitched at an erudite audience that would probably prefer not to countenance it in the first place, the movie’s main achievement is to remind us how fantastic the book is — and how elusive. Neither tragedy, nor love story, nor “topical” condemnation of the excesses of the Jazz Age, The Great Gatsby employs strategies that are so oblique that its evisceration of the American ethic will not soon become stale. The failure of the book’s moneyed characters to achieve the status of tragedy constitutes the tragedy. And it’s hardly parochial or partisan: if you’re an American, it doesn’t matter what your bank balance is, you too are implicated. Overlong by a good half-hour, Clayton’s version does much right but fails to registers on an emotional level. It’s the opposite of lazy — if anything, everybody’s working too hard. Farrow, Redford, Dern, Black, Waterston — most of the casting decisions are smashingly right, and the movie looks and sounds just fine. Mia Farrow’s instinctive approach results in a fair approximation of Daisy, and hardly more could be asked of Bruce Dern and Karen Black. If Robert Redford lacks a certain something, it’s understandable in that he’s practically playing a hologram. Unlike the Brits, we don’t really do reverence, which is what a project like Gatsby inevitably elicits. No, to do The Great Gatsby right you may have to get rid of The Great Gatsby. Late in the movie we’re treated to an arresting closeup of a goldfish pond, which has striking resonances with another #1 from 1974, a genre movie that may serve as the best crypto-adaptation of The Great Gatsby we’re ever going to get: Chinatown. What here smacks of 1974? The heedless ambition of the New Hollywood. IMDB synopsis: Nick Carraway, a young Midwesterner now living on Long Island, finds himself fascinated by the mysterious past and lavish lifestyle of his neighbor, the nouveau riche Jay Gatsby. He is drawn into Gatsby’s circle, becoming a witness to obsession and tragedy.